(NORTH BAY, ONT.) – Construction on ‘The Village’ at Canadore College is on track for completion in 2018. Canadore’s model of The Village is the only one of its kind in Canada, focused on collaborative interprofessional education and the integration of Indigenous, Eastern and Western healing and wellness practices. The health and wellness centre will integrate seniors’ and community care, with teaching, skills training and applied research provided by the Canadore College all in one facility. Phase I, the construction of the actual health and wellness building, began in May 2017. 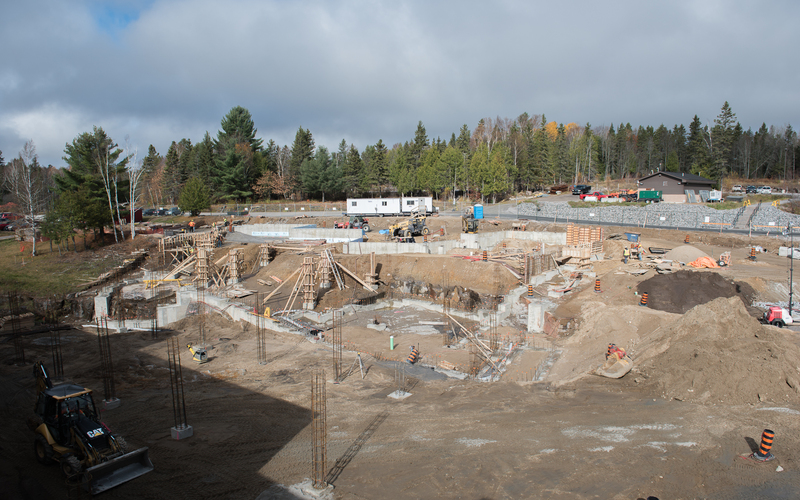 The facility’s foundational footprint has been established and the above-ground structure will take shape in the next four to six weeks. Earlier this week, a request for proposal (RFP) was issued earlier for Phase II, the project’s living residence. The residence would have up to 144 units to provide much-needed seniors’ housing in the region; deliver acute and primary medical care; offer cultural, social, vocational, recreational and spiritual events; incorporate access to a safe mobility clinic; and also include an on-site sweat lodge, healing circle and esthetics studio. Interested proponents have until December 19 to submit proposals. Phase I of the project, including construction and technology, is valued at $20 million in total. Canadore received $5.63 million from the federal government, $800,000 from the province and its fundraising campaign goal is $5 million from non-government sources. The Village fundraising campaign committee will be providing more details in an update scheduled for November 2017.